THE BOYNE VALLEY FOOD SERIES COMES TO MEADE POTATO CO. In advance of National Potato Day on Friday, October 6, Meade Potato Company has opened its doors with “Behind the Scenes with the Spud” tours to encourage people to appreciate the potato, its versatility and the excellent nutritional benefits it offers. 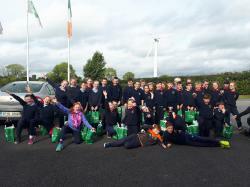 On Thursday, September 28, Meade Potato Company welcomed the 5th and 6th class students of Heronstown N.S. and Newtown N.S. for a field to fork tour of their farm and food production facility. Farm Manager Conor O’Malley brought them into a field of Rooster potatoes where he explained the fundamentals of growing. They then followed the journey of the spud as it enters the packhouse and is bagged in preparation for dispatch to their customers. A quiz by the Meade QA Manager on the different varieties revealed that there were many spud lovers in the audience who knew their stuff when it comes to spuds. 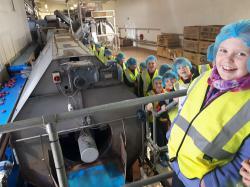 A trip to the Meade Prepared Foods Division also allowed them to witness the journey of those spuds that get peeled and sent on to foodservice and catering customers. The children were able to witness starch being extracted from the potato peelings for sale onwards to food ingredient and clothing companies. They learned how these complementary businesses help ensure as much of the potato as possible is used with a view towards maximum sustainability. 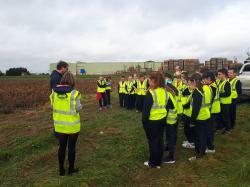 Students heard about the many ways the company aims to be as green as possible. From its zero food waste status to its new water filtration system to its widespread use of skylights and work with community foodbanks, Meade Potato Co. showed examples of how they have tried to manage their resources efficiently. 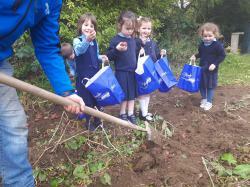 “I was really impressed by how tuned into being green the children were. It’s great to see that awareness at a young age; hopefully this will carry through all their lives,” observed Jeni Meade who conducted the tour. After a brief tour of the Fruit and Vegetable Division, the students heard about the many nutritional benefits of the potato and got a well-deserved meal and goody bag of fruit, veg and potatoes to bring home. “Our aim was to ensure the children appreciated how good for you potatoes are – more fibre than two slices of brown bread, more potassium than a banana and loads of Vitamin C, B1 and B6. With any luck, they will demand potatoes at every meal from now on!” said Eleanor Meade on the day. Combining efforts to promote National Potato Day and celebrate the bountiful food of the Boyne Valley, the company also hosted a Boyne Valley Food Series event in honour of the spud on Friday, September 29. With an array of foodies from near and far, the guests went behind the scenes with the spud from the field to the fork. Sustainability and nutrition were covered during the tour, which ended with a feast celebrating the spud. Using the produce of fellow Boyne Valley food producers was an important part of the meal experience; guests enjoyed artisan sausages from the Whole Hogg based in Slane, carrots freshly harvested from the Meade fields and apple juice from Stameen Farm (with some sampling of their Dan Kelly’s Cider for the non-drivers!). But the star of the show was the spud, which went global for the meal. Showcasing the versatility of the spud is a main aim of National Potato Day so the spud was offered here in traditional ways of mashed, chipped and champ, as well as Swedish Hasselback potatoes, French Dauphinois and Indian curried potatoes. “It was brilliant to see the spud used in so many dishes; it really is such a versatile and nutritional food. 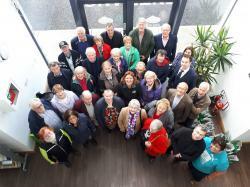 We thoroughly enjoyed the meal and the tour,” said visitor Gerry Farrell. Rounding out celebrations was a Dig Your Dinner Day at the Heronstown National School where allt he students went out to the school garden and dug up the rooster potatoes they had planted earlier in the year. 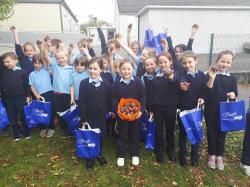 Fresh spuds were enjoyed all around Lobinstown on National Potato Day - goal achieved! National Potato Day is a nationwide effort of potato growers in association with Bord Bia to publicise the many health benefits of the potato and its versatility as an important part of the Irish diet. Tomatoes are actually fruits and are made of 94.5 percent water. They are one of the most popular 'fruits' in the world as they feature in the cuisines of many different countries.